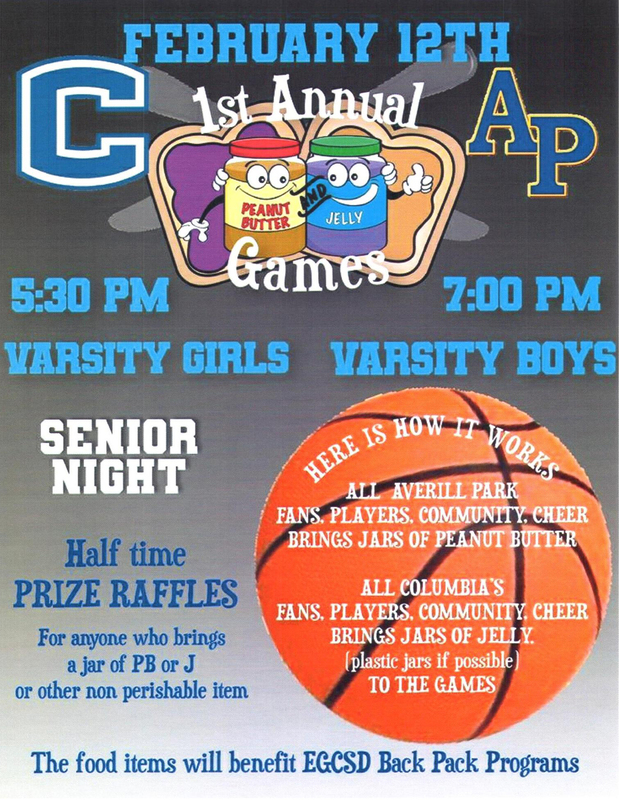 The Columbia High School and Averill Park varsity basketball programs are playing the inaugural Peanut Butter and Jelly Games on Tuesday, February 12 to benefit the East Greenbush Central School District’s Backpack Program. The girls’ varsity games starts at 5:30 p.m. and the boys’ varsity game starts at 7:00 p.m. Both games will be played in the Columbia gymnasium. Averill Park players, cheerleaders and fans are encouraged to bring jars of peanut butter and Columbia players, cheerleaders and fans are encouraged to bring jars of jelly (plastic jars if possible). All food items donated will be used by the Backpack Program which provides food to students who may be at risk for needing meals during weekends and school breaks. Anyone who brings a jar of peanut butter, jelly or other non-perishable item will entered into raffles with prizes given out at halftime of the boys’ varsity game.